distribution The southern 2/3rds of the Coastal Plain and extreme eastern Piedmont, ranging sporadically north to Franklin (Piedmont), Edgecombe, and Martin counties. Of widespread occurrence in the Sandhills and southern 35-40% of the Coastal Plain. NC lies at the northern end of the species' range. abundance Common in the Sandhills and southern/southeastern Coastal Plain counties, especially where pocosins, savannas, limesink ponds, and other non-riverine waters are present. Rare to uncommon north of Johnston and Craven counties, and rare in the narrow portion of the range into the Piedmont. flight Mainly in summer and early fall; early June (rarely as early as early May) into early October, rarely to mid-November. habitat Breeds in pools, ponds, and lakes, where well vegetated. behavior This species, as do most other pennants, perches on twigs and vegetation fairly low to the ground. Adults often forage well away from ponds, such as in savannas and flatwoods. comments This is one of the most often encountered dragonflies in late summer when one is walking in savannas, flatwoods, pocosin margins, and the vicinity of limesink ponds, in high quality natural areas such as found in Croatan National Forest, Holly Shelter Game Land, and the Sandhills Game Land. 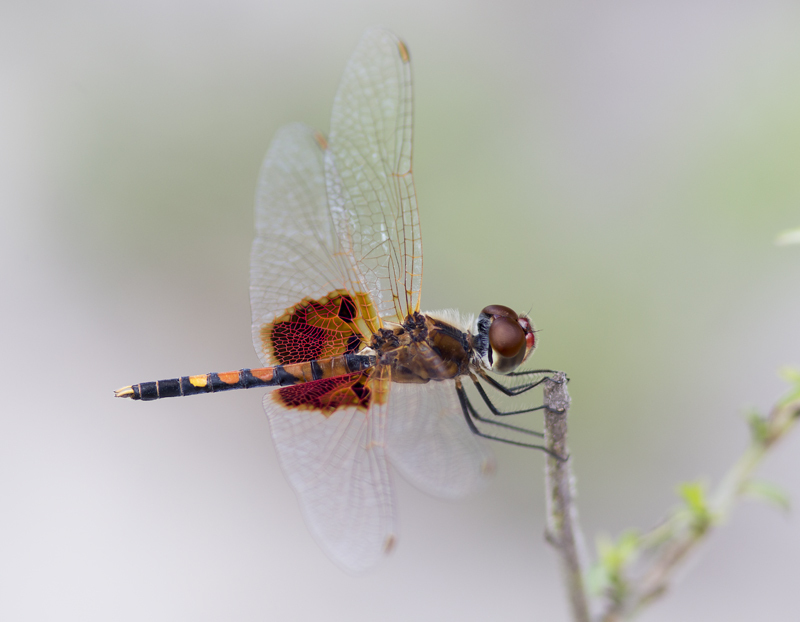 It, along with the Halloween Pennant, seems to forage farther away from water than do the other Celithemis pennants in NC. Comment: Craven, 2018-09-01, Croatan N.F., powerline ROW at intersection of Catfish Lake Rd. and Little Rd. Comment: Carteret, 2017-05-21, - Patsy Pond. Single immature male with damaged wing.